Transferring stage plays to film are always a tricky thing to do. What does a director do? Should they broaden the production by taking the characters away from their original settings? Or keep as close to the play as possible and have it as a one-set show? That is what director and star Denzel Washington have decided to do with August Wilson’s award-winning tale. Forget about making it cinematic, just film it as it was intended to be performed. Does it work with Fences? Sort of. Troy is a middle-aged man in 1950’s Pittsburgh who works as a trash collector. Every Friday, he and his best friend, Bono, sit around his backyard while Troy puts the world to right with his quite vocal opinions, while still clinging to his past, when he missed the chance of being a baseball superstar. With his long-suffering wife, Rose, and his two children, one who has the chance of being a professional football player, Troy rules the household with an iron claw but he has secrets that could affect his position. Written by award-winning playwright August Wilson, this is a highly respected and critically acclaimed piece of theatre. which Washington starred on Broadway in 2010 (Lenny Henry played Troy in the West End). He has now brought that same production to the big screen, which is one of the film’s problems. What we get isn’t a cinematic version of the play but a straight from stage to film production. It very rarely leaves the confines of the backyard and this is certainly very dialogue heavy. There is very little action, very little plot development, just a study of a grumpy old man who regrets his past and who wants the world to know this. When watching something like this in the natural surroundings it was intended, you can allow the pages of dialogue as we get to know the characters and we can accept that this is what you get when watching a play. On film, we have to work harder when nothing much else is happening and so for the first hour, as we listen to Troy’s continuous theories on life, it does become wary and a struggle. It’s not until we find out that events that Troy has been hiding that the film really kicks into gear. Up to then, this is a masterclass in acting. Every person in this film should be celebrated for delivering exceptional performances. Yet it is the two leads, Washington and the amazing Viola Davis, that really touch us. Washington has a real passion for this play, for August Wilson and for Troy. In fact, in recent interviews, he has defended Troy as if he was a real person. With Washington, he has become a real person. His conversations are as real as anything you will hear on screen this or any year. His attitudes and opinions are shared openly with gusto and ferocity. It is the kind of performance that awards were made for and if it wasn’t for Casey Affleck’s breathtaking performance in Manchester By The Sea, Washington would walk it. It’s that good. Then there is the wonder of Viola Davis. As the loving Rose, she shows every inch of her life etched across her face. Not given half the dialogue as her partner, she shows that acting is not about what you say or how you say it, it’s how you react and there are long sequences where she doesn’t speak a word yet we know everything that is going on in her head. Only when Troy’s secret comes out that Davis is given the chance to really shine and she does with heartbreaking realness. It is an amazing performance by an actress who deserves far more recognition now. 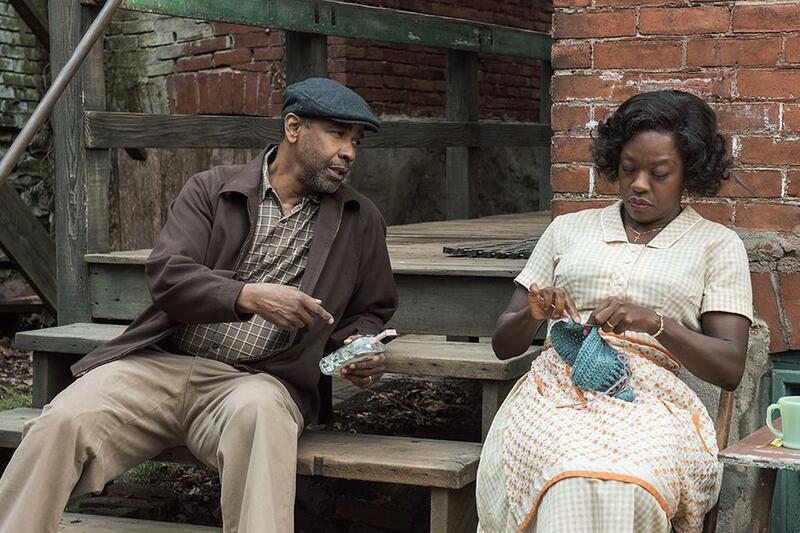 Fences isn’t going to excite everyone who sees it. It is challenging and your concentration is pushed to the limits but there is something very satisfying once it has finished (and at 2 hours 19 minutes, it’s a long stretch). It is a brilliantly written piece full of great performances and for that alone, it’s worthwhile.